Keep informed about our work. The course promotes participant's exploration of the nexus between non communicable diseases and disability, non communicable diseases and infectious diseases, and non communicable diseases within the broader public health and global development agenda. This course provides a grounding for participants with a background or interest in public health on the normative content and interpretations of the right to health (and supporting rights). On 28 February 2019, Nossal Institute’s Prof Barbara McPake, Prof Peter Annear, and Katherine Gilbert were in Ho Chi Minh City, Vietnam to meet with several health partners with to discuss their upcoming research on early declaration and effective prevention of illness in poultry in the Mekong region. On 26-27 February 2019, health leaders from 15 Pacific Island Countries met in Suva with representatives from World Health Organisation (WHO), European Union, World Bank, Australian Department of Foreign Affairs and Trade, Nossal Institute and The Pacific Community (SPC) to discuss subregional collaboration for specialised health care services. Belinda Spagnoletti, A/Professor Linda Bennett and A/Professor Michelle Kermode from the Nossal Institute, along with Professor Siswanto Wilopo from Gadjah Mada University, have been awarded the Wang Gungwu Prize for the best article published in the journal, Asian Studies Review in 2018. Universal Health Coverage: Old Wine in New Bottles? Professor Ajay Mahal discusses whether there is any value left to the UHC agenda. As leaders in international development, Nossal Institute attended the 2019 Australasian Aid Conference at the Crawford School of Public Policy in Canberra last week. Dr Gregory Armstrong, a Senior Research Fellow with the Nossal Institute for Global Health, was recently invited to write an article for Lancet Public Health on suicide in India, which he titled ‘Suicide in India: a complex public health tragedy in need of a plan’. 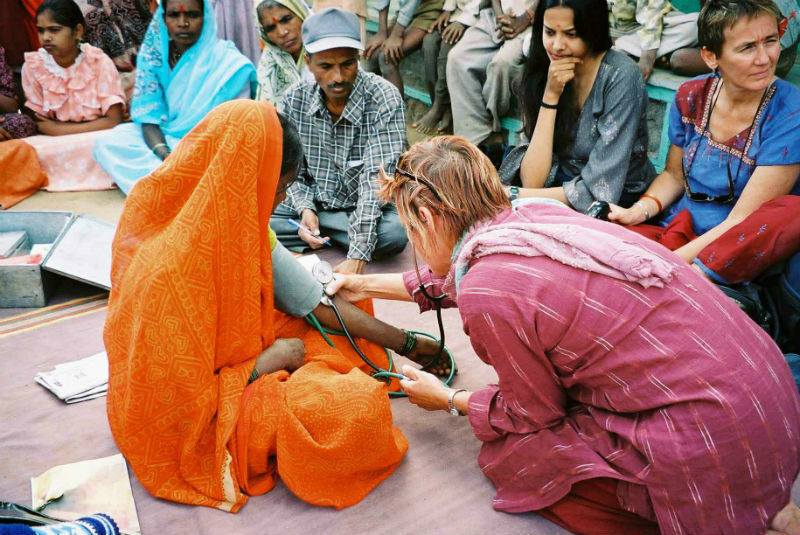 The Community Health Global Network - Uttarakhand Cluster recently celebrated 10 years at an event in Dehradun, India. The chief Guest, Mr Mann (MLA for Uttarakhand) spoke about the importance of the NGO sector working closely with the Government health system. A/Prof Nathan Grills from the Nossal Institute spoke about the history and effectiveness of working together to bring health care to the margins. Dr Alex Robinson and Dr Liem Nguyen from the Nossal Institute’s Disability Inclusion team recently facilitated a 2 day workshop on disability data for the United Nations Economic and Social Commission for Asia and the Pacific (ESCAP), Bangkok. Registrations are currently open for The University of Melbourne Health Economics Group's (UMHEG) workshop which is being held on Wednesday 14 November 2018. The workshop is an opportunity for members of the UMHEG to share research being undertaken. Attendance is free of charge but registration is required for catering purposes. For more information and to register please click here. Nossal Institute for Global Health was proud to be involved in the recent Fifth Global Health Systems Research Symposium in the UK. The Nossal Institute is supporting people with disability in Kiribati gain access to vocational training and skills development to strengthen employment pathways. Nossal Institute in collaboration with UNICEF and FutureLearn gives global health professionals the skills and confidence through evidence-based research and practical examples to understand the complexity, analyse, and take decisive action to strengthen health systems. Nossal Institute for Global Health, in collaboration with UNICEF; facilitated a skills building session on health systems capacity building at the 5th Global Symposium on Health Systems Research in Liverpool, UK yesterday. On 17 September 2018, Sir Gustav Nossal introduced Dr Jonathan Quick, of Harvard Medical School at the event and discussion related to his book launch, The End of Epidemics. Prof Ajay Mahal from Nossal Institute delivered the Closing Keynote at the Global Ideas Forum 2018 over the weekend. In order to plan for, monitor and measure the outcomes of disability-inclusive education, governments need valid, reliable and feasible processes for determining disability among school students and for disability disaggregation of Education Management Information Systems. A new ethical toolkit is being developed by Dr Bridget Pratt which helps researchers, community organisations and other partners include communities in setting the agenda of health research projects that impact them. Nossal Institute led research in Bangladesh has prompted re-thinking how people access assistive products. Fewer people miss out than in previous estimates, but people with the most needs are the least likely to have them addressed. Nossal Institute’s Disability Inclusion for Health & Development team has been providing high-level technical expertise on national reporting mechanisms for the Incheon Strategy to ‘Make the Right Real’ for Persons with Disabilities in Asia and the Pacific 2013-2022. On Monday and Tuesday 28-29 May, the Nossal Institute at the University of Melbourne, supported by the Department of Foreign Affairs and Trade hosted a visit to Melbourne by Ms Shakuntala Doley Gamlin, Secretary of the Department of Empowerment of Persons with Disabilities (DEPwD) in the Indian Ministry of Social Justice and Empowerment. The Secretary was accompanied by Joint Secretary Dr Prabodh Seth.This visit was facilitated by A/Professor Nathan Grills from the Nossal Institute and Professor Bruce Bonyhady from the Melbourne Disability Institute. It builds on their research in disability in India and is the culmination of a Development-For-All focus at the Australian High Commission in New Delhi. How to improve the prevention and self-management of type 2 diabetes in real-world settings? Dissemination of Findings (March 24, India)The project utilises the Rapid Assessment of Disability (RAD) to study the The Impact of Disabled People’s Organisations. The study results were released in Uttarakhand, North India on the 24th March 2018. Over 120 people, including government officials, the media, DPO members and others with disability, and various NGOs working in disability were represented. There was significant local interest as to the policy implication and the event received widespread media coverage in Uttarakhand, North India. Community-Led Total Sanitation in Timor-LesteNaomi Francis has a Bachelor of Environmental Engineering and Arts with honours in Development Studies from the University of Melbourne. She worked for several years conducting flood studies with engineering consultants BMT WBM. Currently, Naomi combines her studies with water, sanitation and hygiene research consulting in South Asia and the Pacific as well as tutoring and lecturing at the University of Melbourne and RMITIn 2015, around one-third of Timor-Leste’s rural population still did not have access to safe water, sanitation and hygiene (WASH); however, there is sparse research about the nature and outcomes of the many interventions implemented in Timor-Leste to address this. As part of an NHMRC-funded trial entitled ‘WASH for Worms’, this PhD research explored a WASH program implemented in remote parts of Manufahi Municipality, Timor-Leste with particular focus on the sanitation component which was based on ‘Community-Led Total Sanitation’ (CLTS). In Vanuatu, people with disabilities are at least twice as likely to be injured during a cyclone than people without disabilities—according to a new report published by the CBM—Nossal Partnership for Disability Inclusive Development. Between 28 August to 22 September 2017, 85 UNICEF staff participated in a two-week workshop on Health Systems Strengthening (HSS), offered in back-to-back cohorts. This was the final component of a blended learning program that began in May 2017. The Nossal Institute is delighted to announce that our very own Professor Tilman Ruff and the International Campaign to Abolish Nuclear Weapons (ICAN) have been awarded the Nobel Peace Prize. Leading international thinkers discuss ambitious international commitments to leaving no-one behind: disability, social inclusion, health and sustainable development. On Wednesday 5th April, the Global Health Alliance, based at the Nossal Institute for Global Health, hosted a private briefing for Alliance members with Dr Shin Young-Soo, Regional Director, WHO Office for the Western Pacific and Dr Vivien Lin, Director, Health Systems, WHO, WPRO. Nossal Institute adds voice to global call for action in rehabilitation. Ageing populations and changing population health trends require a massive scale-up of appropriate rehabilitation services. The Nossal Institute for Global Health recently participated in the historic Rehabilitation 2030: A call to action, held at the headquarters of the World Health Organization in Geneva. In our region, economies are growing, populations are ageing and the burden of disease is shifting. How can we make health systems more flexible and more sustainable? A study on the effectiveness of Cambodia's Health Equity Fund program, which subsidises basic health care for the poor, was launched by the Nossal Institute and its partners last month in Phnom Penh. Health delivery in many low to middle income countries is being compromised by private operators offering poor service by unqualified practitioners at exorbitant cost, according to a new Lancet Series co-edited by the University of Melbourne and the London School of Hygiene and Tropical Medicine. Since 2013, Ms Sally Baker has been advising the Australian Government-funded Vanuatu Technical and Vocational Education and Training (TVET) Sector Strengthening Program in disability inclusion. Sally developed and oversees the implementation of a strategy which addresses the barriers which prevent people with disability from accessing skills development activities such as agriculture and handicraft production training, alongside everyone else. The state of Manipur in Northeast India has been characterised by the dual public health problems of illicit injecting drug use and consequent HIV and hepatitis C infection for more than two decades. During the month of April, Associate Professor Michelle Kermode from the Nossal Institute and Dr David Jacka from Monash Health were working in Manipur to strengthen the delivery of methadone treatment for people who inject opioid drugs such as heroin. In March 2016 an exciting International Forum ‘Better Together’ took place in Dehradun, North India. Facilitated and coordinated by Dr Grills of the Nossal Institute, approximately 40 people from eight countries met together to develop improved collaboration, effective networking and translate the current research into effective practice. Researchers give breath of life to critically ill children in developing countries. Lisa Mamone looks at the tropical disease burden impacting the developing world, and the training that's needed to equip health workers and researchers to tackle it. Our units are engaged in research, education and consultancy services promote evidence-driven global health. Read more about our units and their work. We are passionate about the training and mentoring of the next generation of global health leaders. Read more about the range of research degrees are offered at Master and Doctorate level within the Melbourne School of Population and Global Health. Originally from the UK, Professor Barbara McPake joined the Nossal Institute in 2014. Learn about our Mission, Vision and Values, and the history of our institute. Meet our dedicated staff members.